A safe arrival in French Guiana for Space System Loral's (SSL) second high performance satellite designed and built for Australia's national broadband network—nbn™—has been announced. 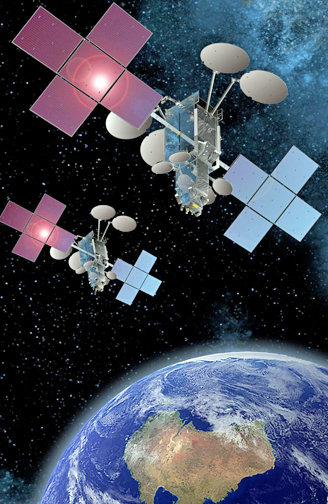 Artistic rendition of the nbn satellites on orbit. This new satellite is Sky Muster II and will climb to orbit with the powerful assistance of an Arianespace Ariane 5 launch vehicle and will be used in conjunction with the first Sky Muster satellite to provide high speed broadband service to more than 200,000 Australians. Similar to the first nbn satellite, which was also built by SSL and launched last year, Sky Muster II is a Ka-band, high-throughput broadband satellite that uses multiple spot beams in an advanced design that optimizes bandwidth for Australia’s widely distributed population. Together, the two satellites will provide advanced services to Australia’s most difficult to reach citizens, including those in mainland Australia and Tasmania, as well as those on offshore islands including Norfolk Island, Christmas Island, Lord Howe Island, Cocos, and Macquarie Island in the Antarctic. Space Systems Loral (SSL), a leading provider of innovative satellites and spacecraft systems, today announced that its second high performance satellite designed and built for Australia’s national broadband network (nbn™) has arrived at the European Spaceport in Kourou, French Guiana, where it will be launched aboard an Ariane 5 launch vehicle by Arianespace. The satellite, called Sky Muster II will be used in conjunction with the first Sky Muster satellite, to provide high-speed broadband service to more than 200,000 Australians. Sky Muster II is based on the powerful SSL 1300 platform, which provides the flexibility for a broad range of applications and advanced technologies.